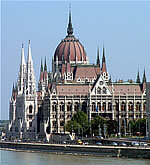 On Saturday, I will leave for Budapest, Hungary for a a week of outreach in Hungarian public high schools. My team includes one other Campus Crusade for Christ staff member and 9 teenagers for the Orlando area. Several of them were on the same mission project with our family this past summer in Hungary. Each day, we will be going to different schools and speaking in 2-3 classrooms. We will be using American culture as a platform to talk about our lives and the difference God has made in them. We will be working with the local Campus Crusade ministry team of Hungarians and Americans. Our time in Hungary will have a long-term impact as their team continues to follow up on the relationships we build and involve the Hungarian students in the high school ministry in Budapest. I am planning to blog updates about our trip on our ministry website, bridgforthfamily.com. I will also be posting a prayer guide that you can download and join us in prayer for God’s work in the lives of Hungarian teenagers.